Can calming aids soothe your cat? Maybe. There’s evidence—both scientifically analyzed and anecdotal— that cat pheromones can reduce stress-related behaviors by 90% or more. These behaviors include inappropriate scratching, spraying, and cowering in fear. Multiple cat homes benefit from them, too. The best calming aids are feline social lubricant, minimizing aggressive and territorial behaviors. In this article, you’ll learn about the various types of calming aids for cats and which ones work best. After considering your options, check out our list of the top 5 best calming aids for cats. Once you know how to choose and use calming diffusers, sprays, collars, treats, and drops, we’ll talk about long-term solutions. You’ll learn how to manage your cat’s stress throughenvironmental and behavioral modifications. 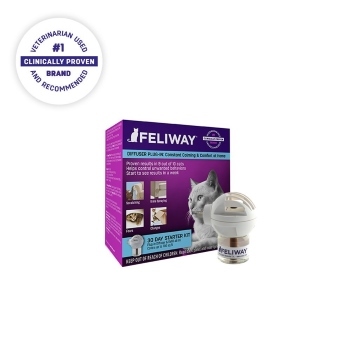 The most popular pheromone product on the market, Feliway, replicates your cat’s F3 facial pheromone. Your cat secretes this pheromone in their cheeks and releases them when they feel relaxed in an environment. When you apply a synthetic pheromone product, you’re sending the same chemical message your cat would communicate by rubbing their face against an area. Feliway is recommended by veterinarians and it gets rave reviews from customers, but there’s no conclusive evidence that it works. Here’s a summary of the studies performed on this calming aid. The F4 pheromone and its synthetic analogue, Felifriend, can help to minimize cat-to-cat aggression. Cats use this pheromone to mark familiar individuals. If your house is a feline stress zone, a pheromone diffuser is your best choice. These devices cover a large area and distribute pheromones 24/7, meaning that they’re working at all hours to minimize your cats’ stress. While diffusers are a great choice for at-home stress management, pheromone sprays allow you to control your cat’s stress anywhere and anytime. You can spritz the product in your cat’s carrier or bedding when on vacation or headed to the vet. Like pheromone sprays, these are best for temporary stress. You can use them to wipe down your cat’s carrier or kennel when traveling to a boarding facility or vet’s office. But compared to sprays, wipes are less versatile. They work best on hard surfaces and, like baby wipes or any other wet wipe, they’re likely to lose moisture before you have a chance to use them. Sergeants Pet Care Products introduced pheromone collars in 2009. They’re a good option for those who don’t want to worry about applying the product and would prefer to let their cat carry it around on their body. These calming aids don’t contain synthetic pheromones. Instead, they use herbs, flower essences, vitamins, minerals, and amino acids to produce a calming effect. One of the most promising ingredients used in cat calming products is L-theanine, an amino acid naturally found in green tea. This amino acid soothes without sedating. Others contain herbal blends or flower essences. Soothing herbs include chamomile, hops, valerian, skullcap, and passionflower. And a final consideration—try hemp. Hemp-based CBD oils have a well-documented reputation for treating feline anxiety. Check the labeling to ensure that you’re giving your cat a safe, non-psychoactive treatment that will calm your cat without making them feel ill.
Cat product reviewers and forum posters agree that Ceva’s Feliway is the most effective pheromone product for cats. This diffuser releases a 2% concentration of synthetic feline facial pheromone for up to 700 feet in your house. 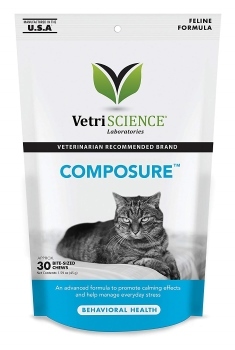 This makes it a good choice for cats exhibiting generalized stress and anxiety in the home. 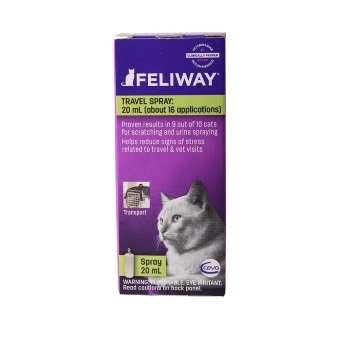 If you need Feliway for travel, you may prefer a smaller spray bottle. The starter kit comes with a plug-in diffuser and a 30-day supply of Feliway liquid. According to Ceva, you should see a reduction in stress-related behaviors in as few as 7 days. While the Feliway diffuser is a good choice for home use, this spray bottle makes it easy to spritz pheromones in your cat’s carrier or bedding. It’s a good choice for the home, too, where you can spray the pheromone solution on problem areas. It’s available in a 60ml or 219ml bottle, offering about 50 or 1,400 applications, respectively. These chewy treats contain a mixture of soothing ingredients, including C3 colostrum, L-Theanine, and Thiamine. These ingredients work together to support cognitive function, encourage dopamine production, and support the central nervous system. According to VetriScience, the effects will start to show 20-30 minutes after your cat eats the treat. The treats have an appetizing chicken liver flavor and a chewy texture that, according to customer reviews, cats enjoy. Of all the products on this list, these calming chews receive the most inconsistent reviews. Some customers say that they’re a magic bullet for stress, while about 20% say that they did little to nothing for their cats’ anxiety. 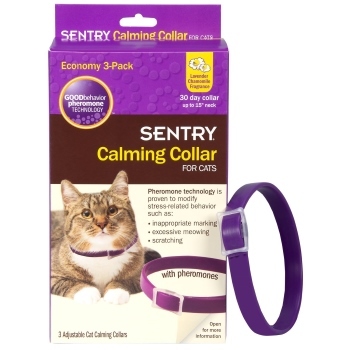 If you want the pheromone effect to follow your cat wherever they go, you might like this calming collar from Sentry. It uses patented “Good Behavior pheromone technology”, which is activated by contact with your cat’s fur. The collar’s effect lasts for 30 days before you’ll need to replace it. It has a synthetic lavender chamomile scent, which may irritate some cats or humans. The collar doesn’t have a breakaway mechanism. This makes it more dangerous than a traditional breakaway collar. These calming drops are a homeopathic blend of flower essences, including Star of Bethlehem, Rock Rose, Cherry Plum, Impatiens, and Clematis. 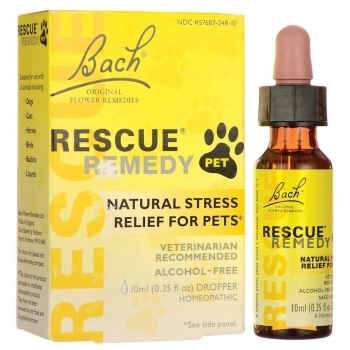 According to Bach, these essences help to minimize stress and anxiety in both cats and dogs. Customer reviews are mixed, but most say that it’s an effective remedy for stress in cats. One said that their cat transformed “from psychotic to puuurrrrfect!” after taking a few drops of Rescue Remedy on a treat. Use 4 drops daily in your cat’s food or directly into their mouth, re-administering as needed. Think of cat calming aids like a scented candle. Lighting one can help you relax, but no amount of melting praline cheesecake—scented wax will make you forget that you’re behind on the rent and about to miss a deadline at work. 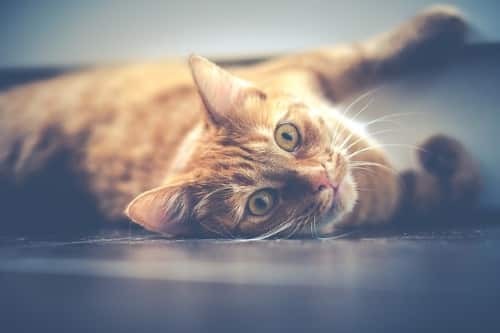 Environmental and behavioral modification will help to reduce your cat’s stress to a manageable level, allowing calming aids to take care of the rest. Without appropriate environmental enrichment, your home is designed for humans alone, providing none of the stimulation and security that your cat requires. Click here for our list of the top 10 best cat trees. As social creatures, humans like the idea of feline friendships, but the reality is that cat-to-cat alliances are rare. Bonds between three or more cats are even more unlikely, meaning that most multiple cat homes are unnaturally and stressfully crowded. Space constraints can be hugely stressful in a multiple cat home. If you have multiple cats, mentally categorize them in social groups. Cats who sleep together, groom one another, use the same litter box are one social group. Each social group—even if that group consists of just one cat—requires their own place to eat, sleep, drink, hide, play, and use the litter box. Try to minimize your cat’s stress by creating species-appropriate accommodations for each of their core needs. Litter boxes should be in peaceful locations. Each social group should have one or two of their own. Their food and water bowls, likewise, should be in quiet locations. Your cat is a predator who needs the mental and physical exercise of the hunt. Stimulate these hunting instincts by encouraging your cat to play at least once a day. If possible, bring your cat outside for safe adventures in nature. 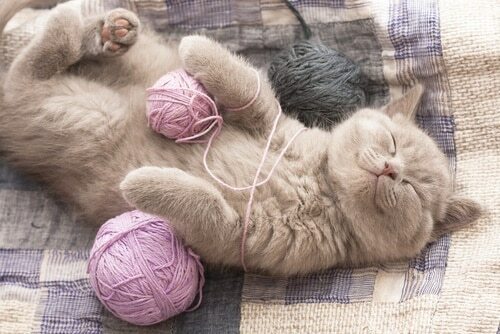 Click here for our list of the best cat toys.